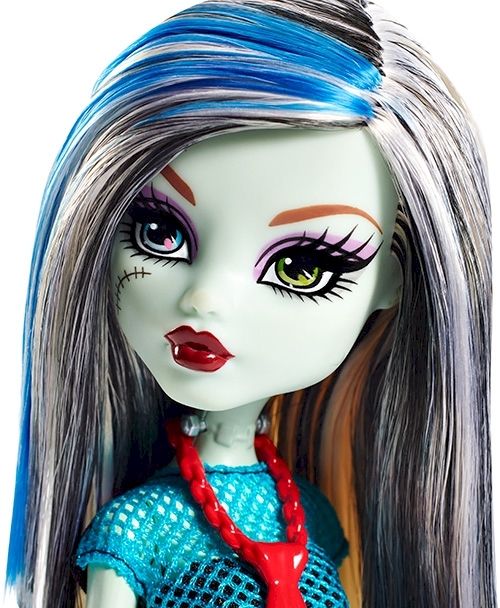 The Monster High™ original ghouls wear their freaky flaws with pride! Their sleek fashions are perfect for a day inside the iconic walls of Monster High™ -- or an adventure in the monster universe outside. Articulation at the shoulders and knees adds to the fun with more scary cool poses and storytelling possibilities. Each doll’s fashion is inspired by her fierce personal style and unique scaritage. Frankie Stein™ doll, daughter of Frankenstein, looks electrifying in her signature plaid print with mesh bodice. Voltageous heels and matching jewelry complete the to-die-for outfit. Look for monsterrific touches, like her black and white streaked hair and body stitches, that showcase her freaky fabulous flaws. Ghouls at home will love learning to embrace what makes them unique along with their beast friends from Monster High™. Collect them all (each sold separately, subject to availability). Includes articulated Frankie Stein™ doll wearing fashion and accessories. Doll cannot stand alone. Colors and decorations may vary.